"We retrieved and seized diving equipment and that will be examined by an expert to see how much air was in the tank," he said. "The cave itself isn’t the issue. It’s most like our fatalities on the road. It’s the individual. "Without casting any assertion on the deceased, we have no idea what caused his death." The pair of close friends held the highest certificates issued by the Cave Divers Association Australia (CDAA). The association's national director John Vanderleest told the ABC there was nothing unusual about yesterday's dive. "Both men would have done the kind of diving that they would have done at that same location many, many times before," Mr Vanderleest said. Police divers this morning begun retrieving the man's diving equipment from the popular diving spot, which features a maze-like cave that extends for at least 7km underground. Some has never been explored. In a statement, the association said it was sad to inform its members of the "tragic loss of one of our friends whilst they were cave diving in the Mt Gambier region". The association confirmed Tank Cave would be closed "until further notice" following the man's death. "No names or details can be released at this stage, but you will be informed once the family has been notified and release of these details is cleared by the police," the association said in a statement yesterday. "The discussion forum has been taken off air for 48 hours to allow time for family and close friends to share this loss, without risk of members unwittingly passing information to those not yet informed." Tank Cave is where world renowned Polish cave diver Agnes Milowka died in February. 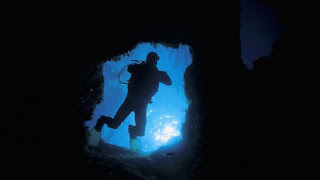 Milowka, 29, ran out of air after becoming separated from her diving companion in the channel system, 500m from the cave's entrance, as she pushed into unexplored territory. It took divers three days to retrieve her body. She ran into grief despite extensive diving experience, including as a stunt diver for James Cameron's blockbuster Sanctum 3D. Before her death, she left a chilling account of a similar dive in Tasmania's Tiger's Eye cave. Tank Cave is considered one of the best diving diving destinations in the southern hemisphere and is the most extensive underwater cave system in Australia and the sixth in the world.